The Gremo 1350VT is a smart creation. And we have designed it bearing you in mind. Working in a 1350 should be a pleasant experience. Also outside the cab. You should not worry about overheating. 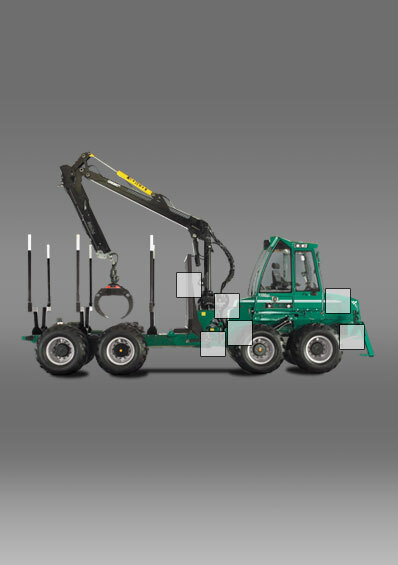 You must not be an acrobat to get onto the forwarder. You should not require an escorting vehicle, where you can store tools and other important equipment. No, in Gremo´s world things are supposed to work properly. The reason is we believe that, when also the smallest things function well, the working day will pass more smoothly and faster. On this page we show some smart details creating better fl ow of work during your shift. 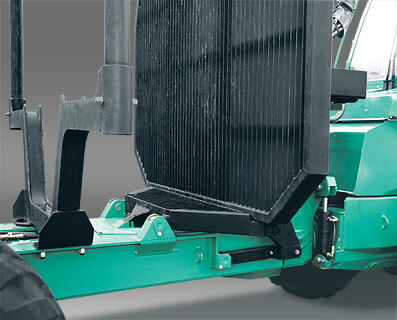 For further information click on a square in the picture to the left or press "Start guide"
The big hydraulically operated folding headboard offers not less than 5.3 m² loading area. 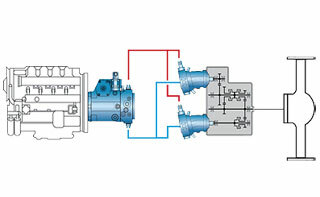 In order to obtain a shiftless speed range the system consists of two hydrostatic engines. >At 11.8 km/h one of the engines is disconnected with the result that the other engine gets all the oil. 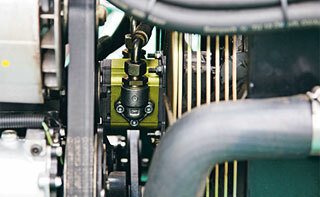 In this way the speed of the machine can be increased to 25 km/h without interruption. When reducing the speed it works the other way round. 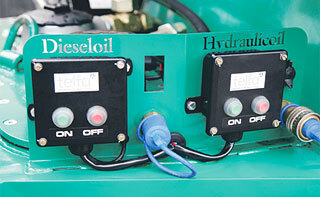 The electronically controlled pump is programmed by the operator. If you want the machine to go slow, for instance in really tricky terrain, you select the previously set position with one push of a button. 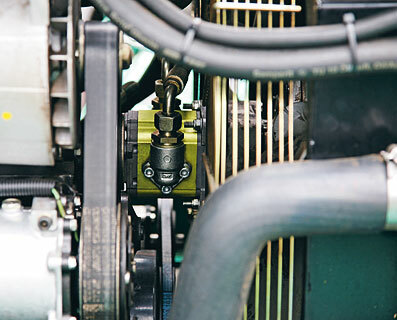 Filling of hydraulic oil via filter by means of a pump is standard. 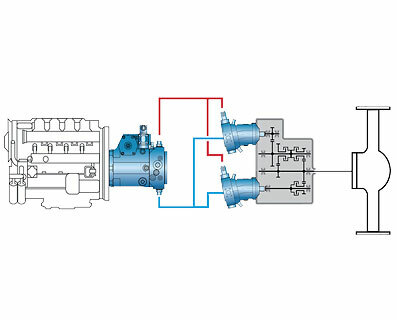 Standard is also the fi lling of diesel fuel by electric pump and quick coupling. Both pumps disengage automatically. 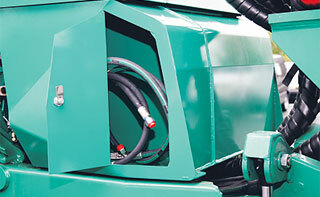 You find a spacious storing compartment next to the big tank for hydraulic oil. 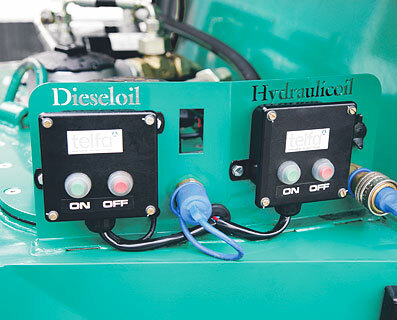 GreControl controls the heat release and governs the speed of the hydraulically driven fan in relation to the cooling requirements. 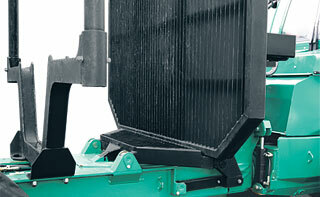 GreControl also makes that the radiators are blown off every 30th minut, when the fan is reversed. 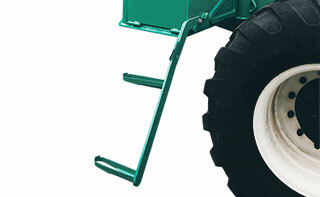 To enable you to safely get onto the forwarder also from the left side you will find a service ladder on the big battery casing. 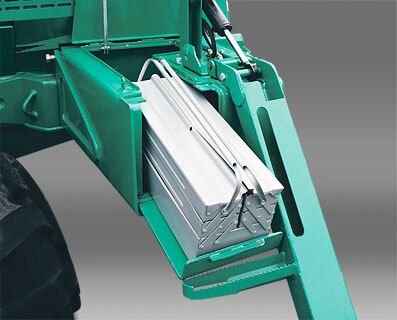 Next to the hydraulic ladder of the cab´s door you find an easily accessible compartment, e.g. for a tool box. At 11.8 km/h one of the engines is disconnected with the result that the other engine gets all the oil. 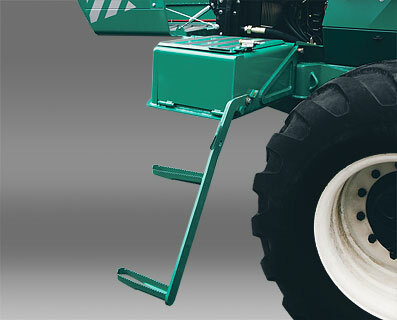 In this way the speed of the machine can be increased to 25 km/h without interruption. When reducing the speed it works the other way round.